The Taken King DLC for Destiny rips up the original Light Level system and replaces it with a linear XP progression system called Character Level. This doesn't mean that Light Level is lost altogether and I'll explain why here. Starting in The Taken King, Light Level is now referred to as Light Score and it's calculated from the average values for attack and defence across all your equipped gear. The final value will determine your damage output and also your defence. 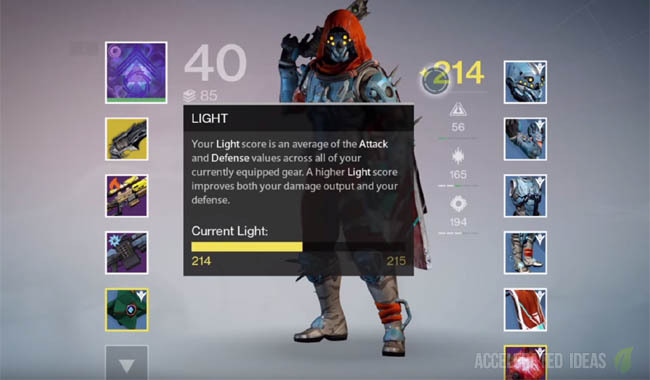 Previously, Destiny only considered the Light Level for your equipped armour in it's Light Level ranking, but with this change the calculated value also takes into consideration your equipped weapons as well (Attack values). It's not clear as yet whether the calculation is just an indicator or if the combined score really does affect both damage and defence. For example, imagine you had some great weapons with really high light value but some god awful armour, would your Light Score really mean that your defence was still ok? We wait to see. Besides your Attack and Defence stats for amour and weapons, Destiny also considers your Ghost and Class Item to determine your overall Light Score. Therefore, if you've equipped a rare Ghost then that'll bring down your score compared to say a Legendary version. Once players reach level 40 they can acquire Level 40 gear. Just as an example, Level 40 armour has a defence stat of 280 which is the maximum value you can climb to in The Taken King. Equipping leveling 40 gear across the board will increase your average stat and thus your Light Score at the same time.